Wow, ten minutes ago, I turned 44. A positive review of the ANIMAL MAGNETISM exhibit that I curated at the Orange County Center for Contemporary Art. The reviewer forgot to mention the name of the curator, but it is a good mention of some of the artists. CLICK FOR DETAI?€‹LS … just RSVP to them and you are in. Tarry?n Teres?a Galle?ry is previ?ewing? their? new galle?ry space? with a party? honor?ing the ACLU and featu?ring artis?t team GRIFF?IN MOSS.? It is a GIANT? wareh?ouse space? and the party? is suppo?sed to be a massi?ve blowo?ut with all the trimm?ings.? CLICK FOR DETAI?LS … just RSVP to them and you are in. It is rare that one of my poems is published (by anyone but myself), but a poem of mine about meeting my favorite poet was included in an anthology/celebration of that poet. The book, Bukowski’s L.A. is now available on Amazon. I have not seen the book yet, so I cannot vouch for it, but it looks good and the guy who put it all together, Matt Dukes Jordan, is pretty diligent about creating good publications, so if you are a fan of Bukowski ephemera, this should be cool. Ask Mat: Do Critics Have Any Power? Sometimes I read reviews and wonder what the critics are even talking about. I?€™m a college educated person. Should I be taking art criticism more seriously? Will a rave review by the right critic set up an artist for life? Who would those critics be? Are bad reviews the kiss of death? Let me know. There are two types of art critics. Those who are desperate (despite all appearances to the contrary) to get invited to the right parties; and those who get invited to the right parties. How to tell who is who – if a critic is a teacher, a University lecturer, a professor of art history, especially if they say this about themselves in the little bio after each published essay – then this person is among the desperate group. If this person writes for an audience of more than 50,000 people whose income is above $100,000 and has been doing so for over 5 years, then this person is among the latter group. These are not absolute qualifications, but I use them to gage the worthlessness of the party banter that masquerades as reviews. Many art world reviews are paid for, often under the table. You pay a critic to write a catalog essay for you. The next few shows get reviewed. You help get a critic hired at your art school, next year he is making fifty grand and you are getting reviews. The TRUE power of the critic is revealed in his or her readers. Since most art writing is nefariously interlinked to personal relationships, you should ignore all of it, but do pay attention to where the critical mass is rising. When Matthew Barney started making waves, his name was everywhere, instantly – nobody has that many friends, especially Matthew Mumblemouth. I am not defending Barney?€™s status outside of his achievement of getting noticed. There are two types of bad reviews. Those that pick on the powerless and those that pick on the powerful. Both work. One is merciless, the other is only practiced by those outside of both academia as well as the art establishment. Oh, and bad reviews are not the kiss of death. Artists who get trashed by the same critic form a fraternity that can achieve strong bonds. Frankly, you can cut and paste a review to omit critical sentences. In fact, why not just paste up a fake review. A dingbat gallery would be impressed as all hell that you ahd a three hundred word review in the New York Times. a day of page layout tutorials could get you started. Who?€™s gonna pay the $11.95 fee to verify this with a Times internet search? Not your average cheapskate gallery dealer, that is for sure. So it is hard to write about my girlfriend’s art and her art career and maintain my critical objectivity, but this is a pretty cool incident. 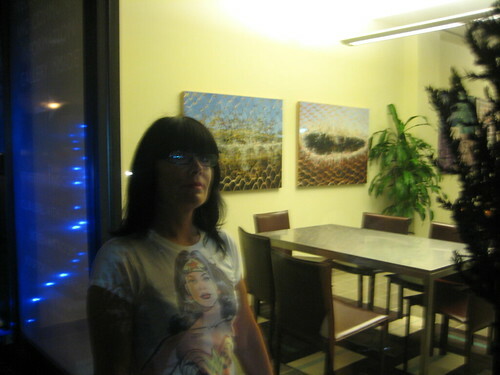 We were walking in Downtown L.A. on Thursday night and we passed a building, a high-end condo place – and in the lobby there, hey look, two of her paintings are hanging. The paintings are 8-10 years old. They look great, she looks great. It was funny, like bumping into an old friend, or maybe even your past self (for her). Her solo show is up at Bergamot Station thru November 1 at the Patricia Correia Gallery. I have jury-curated a show, Animal Magnetism, at the Orange County Center for Contemporary Art (OCCCA) that opens Saturday night. There is a big exhibit at Grand Central Art Center next door to OCCCA, and the group show opening there is curated by Doug Harvey, so two of L.A.’s art world lifers will be down behind the orange curtain this Saturday. I wrote a short essay for a nice catalog that accompanies my show. My OCCCA show runs thru September 27. On a side note, I was thinking of getting a hotel and googled “Santa Ana Hotel” and got references for THIS PLACE perhaps the worst-reviewed hotel in history. I am intrigued, but no way this passes muster with my girlfriend. We’ll pass on the local digs.